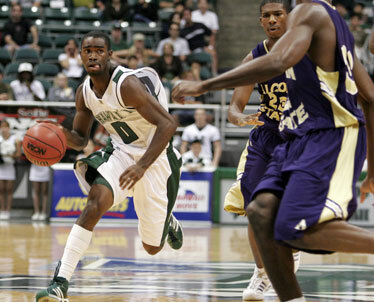 Hawaii's Paul Campbell drove to the basket against Alcorn State's Anthony Searcy during last night's game. The Rainbows won their first game under Bob Nash, 84-55. A Hawaii team on a tight schedule made quick work of Alcorn State last night. With a red-eye flight awaiting, the Rainbow Warriors rolled to an 84-55 rout of Alcorn State to secure win No. 1 of the Bob Nash-era before a crowd of 2,577 at the Stan Sheriff Center. After seeing their first two games slip away in the final seconds, the Rainbows made sure there would be no such drama last night, opening up a 21-point lead at halftime and cruising to the win. "(Nash) should have three of them," UH guard Riley Luettgerodt said. "But I'm happy for him. I'm happy for our team. It's a long time coming and he's got his first head coaching win." Two days after the Rainbows suffered a heart-breaking loss to Illinois, Luettgerodt scored 16 of his game-high 20 points in the first half to lead three Rainbows in double figures. Forward Bobby Nash finished with 15 and center Stephen Verwers had 10, going 5-for-5 from the field. Forward Bill Amis finished with nine points and nine rebounds as all 10 Rainbows who suited up scored. Hawaii's Kareem Nitoto scored six points last night. 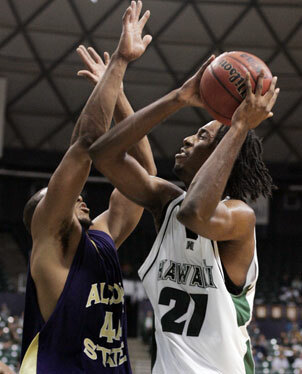 Hawaii shot 50 percent from the field to Alcorn State's 29 percent and the Rainbows outrebounded the Braves 56-37. "We've been close a long time and tonight we were able to win against a good team," UH head coach Bob Nash said. "I liked the way the guys hung together in preparation for this game. They were a little undersized and we took advantage where we had the advantage." After closing a three-game homestand, the Rainbows (1-2) had time for a quick shower before heading to the airport to depart on their first road trip of the season. They're scheduled to arrive in Albuquerque today and face New Mexico on Wednesday at The Pit. "It felt good to get that one, but now we have to look ahead," Amis said. "New Mexico's going to be a tough game for our first road test." Alcorn State (0-3), in the midst of a stretch of five road games to open the season, was led by Anthony Ford's 16 points. Alcorn State entered the game short-handed. Guard Troy Jackson, the Braves' leading scorer going into the game, was among those who weren't available, out with a leg injury suffered against Oklahoma. "That's not what hurt us, we did a poor job of executing, poor job of being patient offensively and missed a lot of shots," Braves coach Samuel West said. "Give me this game again in another arena and we'll make those shots and I think you'll see a better ballgame." 3-point goals -- ASU 6-25 (Ford 4-7, Owumi 1-4, Thompson 1-4, Reed 0-2, Simms 0-2, Blackwell 0-2, Griffin 0-4), Hawaii 5-15 (Nash 3-7, Amis 1-1, Dillinger 1-2, Mayen 0-2, Luettgerodt 0-3). Personal fouls -- Alcorn State 20, Hawaii 17. Steals -- ASU 5(Simms 2, Griffin, Blakely, Kendrick), Hawaii 4 (Luettgerodt, Nitoto, Campbell, Mayen). Blocked shots --Hawaii 6 (Campbell 2, Dillinger, Nash, Amis, Veit). Turnovers -- ASU 16 (Owumi 4, Reed 3, Oliver 3, Blakely 3, Ford, Searcy, Kendrick), Hawaii 21(Dillinger 4, Nitoto 4, Mayen 3, Luettgerodt 2, Nash 2, Verwers 2, Amis, Campbell, Owsley, Veit). Officials -- Terry Cristman, Duane Allen, Tom Yoshida. A -- 2,577.